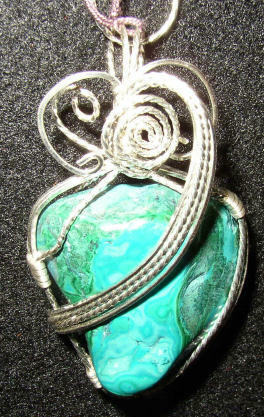 Wire wrapped pendant made from tumbled polished Chrysocolla from Katanga, Africa and Sterling Silver wire. The approximate dimensions are : 1 1/4" W X2 " H X 1/2 " D and includes a cord. 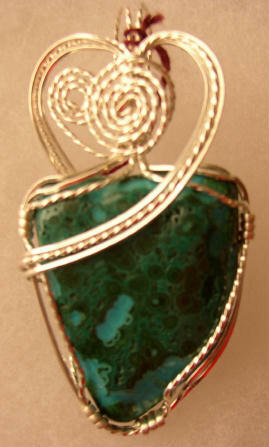 Wire wrapped pendant made from tumbled polished Chrysocolla/Malachite from Katanga, Africa and 14 K/20 % Gold Fill wire. The approximate dimensions are : 1 1/4" W X2 " H X 1/2 " D and includes a cord. 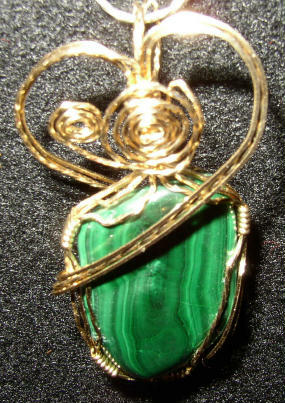 Wire wrapped pendant made from tumbled polished Malachite from Katanga, Africa and 14 K/20 % Gold Fill wire. The approximate dimensions are : 1 1/4" W X2 " H X 1/2 " D and includes a cord. 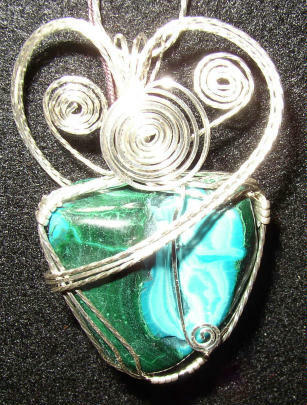 Wire wrapped pendant made from tumbled polished Azurite/Chrysocolla from Argentina and Sterling Silver wire. The approximate dimensions are : 1 1/2" W X2 1/4 " H X 3/4 " D and includes a cord. 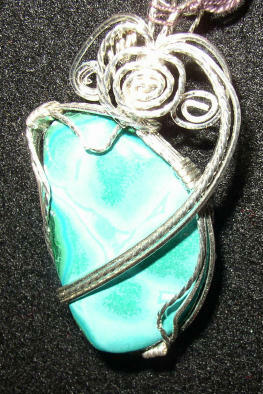 Wire wrapped pendant made from tumbled polished Azurite/Chrysocolla from Argentina and Sterling Silver wire. The approximate dimensions are : 1 1/4" W X2 " H X 1/2 " D and includes a cord. 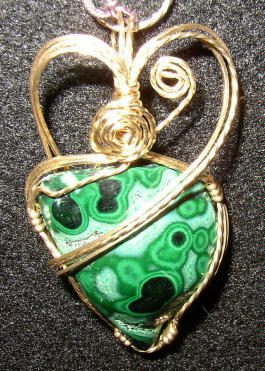 Wire wrapped pendant made from tumbled polished Malachite from Zaire, Africa and 14 K/20 % Gold Fill wire. The approximate dimensions are : 1 1/4" W X2 " H X 1/2 " D and includes a cord. 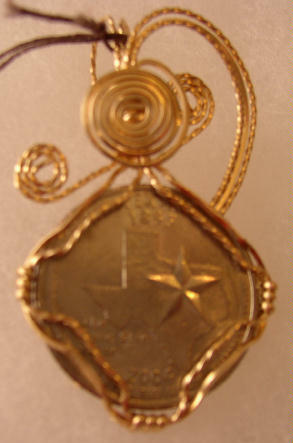 A wire wrapped Texas State Quarter in 14 K/29 % Gold Fill wire. The approximate dimensions are : 1 " W X 2" H X 1/2 " D and includes a cord. 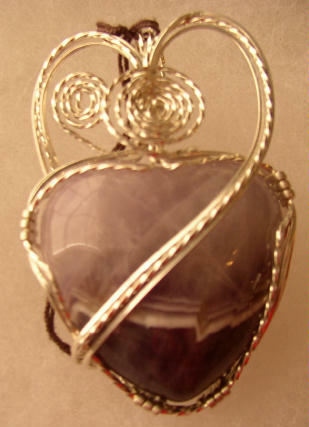 A wire wrapped pendant made from an Amethyst Puff Heart carving and Sterling silver Wire. The approximate dimensions are : 1 1/4" W X 1 1/4" H X 1/2 " D. Includes a cord. 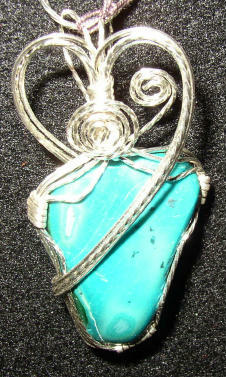 Wire wrapped pendant made from tumbled polished Chrysocolla from Katanga, Africa and 14 K/20 % Gold Fill wire. The approximate dimensions are : 1 1/4" W X2 " H X 1/2 " D and includes a cord. Wire wrapped pendant made from tumbled polished Sodalite from India and Sterling silver wire. The approximate dimensions are : 1 1/4" W X 3 1/2 " H X 1/2 " D and includes a cord.